Students at John S. Jones Elementary School now have a room full of toys, but it’s educational and necessary. 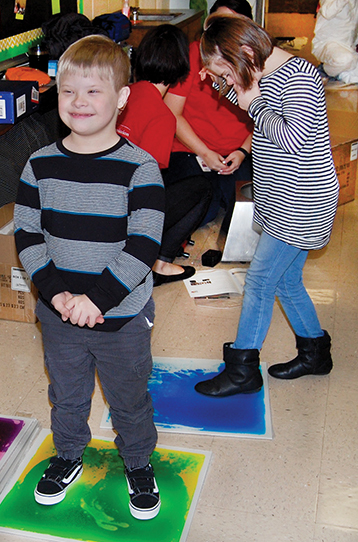 This room, known as a sensory room, is beneficial to students with autism, ADHD and much more. The room features textured toys, bubble machine, dimmed lights, calming music, swings, comfortable chairs, weighted blankets, a wall mural and pressure activated floor tiles, and it really took a village to create this helpful room. Members of the school’s Parent Teacher Student Organization, volunteers with Alabama Power Service Organization (APSO), Bryan Holderfield with Sherwin Williams and Brad Wilson of Pier One Piledriving all helped to make this room a reality. Casandra Maudsley, area chair of APSO, took point on this project. She reached out to special education teachers Diane Hicks, Mallory McGinnis and Amber Works to see what they needed. Maudsley also spent time with the special needs students, who are called “Friends,” to see what they would benefit from the most. that will be installed in the new sensory room. Maudsley, who has been with APSO for six years, contacted the Gadsden branch of Sherwin Williams to see if they would be willing to donate the paint. In turn, the store sent Bryan Holderfield to do the painting, along with the supplies needed. In total, the painting supplies cost nearly $200. “We are so thankful to Sherwin Williams for supplying the paint,” said Maudsley. Maudsley was working with a $1,500 budget and the paint donation freed up more room in the budget to buy some of the additional items, like the multi-color, pressure activated floor tiles and hanging chair that Brad Wilson helped to install. Another helpful donation came from the school’s Parent Teacher Student Organization. PTSO members paid for the calming wall mural inside the room and the beautiful greenhouse inspired wall mural on the outside of the room. Principal Clark, who is in her tenth year as principal, said Donna Garner painted the murals for this project and she has painted other murals around the school. John S. Jones Elementary School is an Alabama Reading Initiative School and received a National Blue Ribbon School Award in 2001.